Also, a girl can't wear the Confederate flag to prom in Tennessee; the British can't even support their own Olympics; Yertle the Turtle is banned in Canada. 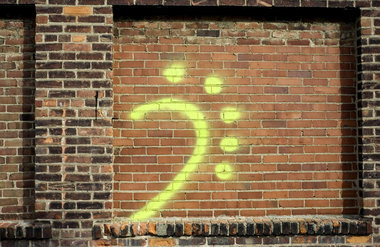 Although Jackson, Michigan's new ordinance against graffiti doesn't spell it out, it would appear that it exists to counter the prolific tagging of a lone street artist. Over the past year and a half, depictions of a one-eyed monster have been popping up on walls all over the town, located 45 minutes west of Ann Arbor. Copyright restrictions prevent me from posting what it looks like, but I have attempted to copy the mutant's head above. (Sometimes, only its foot has appeared, and other times just a turkey leg, which "police believe is intended to represent the monster's food.") Jackson has acted as an incubator to some sweet aerosol-based art for some time – see this paint-crazed old factory, now demolished – but the monster struck such a nerve that officials formed a task force to head off the perceived acts of vandalism. In March, Jackson's police chief announced that his men were "getting close" to arresting the suspect, but so far their can-carrying quarry appears to have eluded the dragnet. OLYMPIC SPIRIT, IN THE U.K.
Dr. Seuss' books have been mined for their messages for decades. Horton Hears a Who is said to tackle prejudice, while The Butter Battle Book is seen as a critique of the Cold War. The Lorax, a classic tale of the horrors of environmental degradation, reignited controversy when it was released as a movie in March, prompting some to declare it was "too liberal." Fox News has said the kids movie was trying to "indoctrinate our children" with its "anti-industry message." A wonderfully named maiden from Gibson County High School, Texanna Edwards, was blocked from her own prom because her dress happened to resemble the Confederate flag. School officials in Dyer, Tennessee, called it “offensive and inappropriate” and wondered why she wore it, given that she was warned not to months ahead of the prom to avoid unspecified race-related issues at the school. Fittingly enough, the Tennessean notes that the "knee-length red dress decorated with bright blue stripes and white stars" echoed the school's official red, white and blue color scheme.